I made two 7-cell NiMH battery packs with 2/3AA KAN 1050 cells from cheapbatterypacks.com. Standard warning: don't try this at home! The batteries arrived after 3 business days. Here are 7 cells, alternating plus and minus ends up. The 7 cells will be connected in series, plus to minus, plus to minus, etc. Electricians tape, stranded copper wire, rosin core solder, wire strippers, 100-watt soldering iron. I taped the batteries together as a 7-cell block. 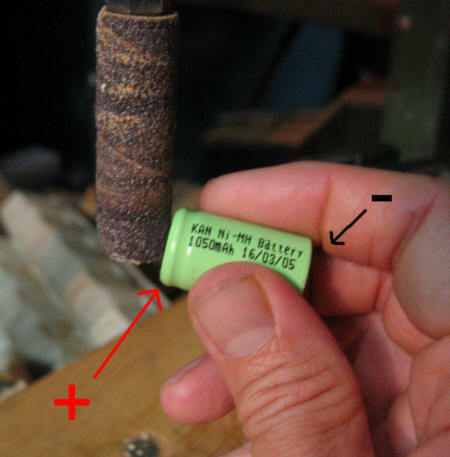 Then I heated a pool of solder on the tops of two adjacent batteries, always minus to plus or plus to minus. My little soldering iron (25 watts) was not powerful enough. It quickly cooled when I touched it to the battery. Using my old 100-watt iron, I heated the center of the tops for about 3 seconds each. I did not heat the batteries any longer than necessary. I was careful not to melt the plastic at the edge of the battery. The metal edge is the battery can, the negative end of the battery. I exposed the metal on the edge of one battery and taped it up. I striped and "tinned" a piece of stranded copper wire by melting a little solder on the wire where it would connect to the batteries. 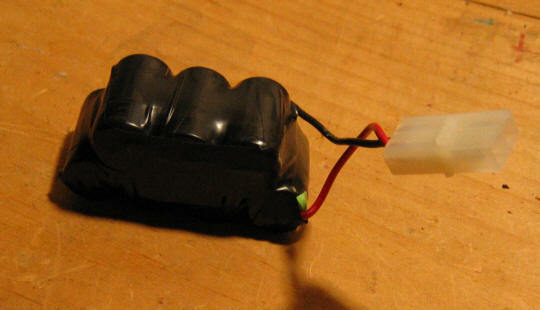 Then I put wire on the solder-topped battery and held the iron on for 3 seconds. The pool of solder looked "wet" and shiny when it cooled. I pulled on it to be sure the connection was good. I checked the voltage again after charging, red to plus, black to minus, got about 9.5 volts for the 7-cell pack. This pack gave me a long, steady flight in my park flyer.